So I’m sure you’ve heard of Unglue.it. I’ve blogged about Unglue.it (https://unglue.it/) before. Here’s an interesting model for ungluing a good and useful book to make it available for all. 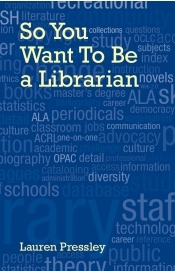 As the title says, if you want to be a librarian, this book is for you. But it might also be for you if you want to help those who are new to the field, or you just want to be reminded of a big-picture view of librarianship as a profession. With your help, we can Unglue So You Want To Be A Librarian. Help Unglue So You Want To Be A Librarian! from lauren pressley on Vimeo. Why Should Librarians (and Those Who Want to be Librarians) Unglue? Unglue.it is something every librarian should be paying attention to. Part crowdsourcing, part open access, part answer to the ebook problem, it’s a solution to some of the most critical issues libraries are facing today. Ungluing a book gives it to the world, so that anyone can access the ebook without Digital Rights Management (DRM), without worrying about how many devices they’ve put it on, and without worrying about legality and compensation issues. Libraries can provide access to unglued books for free, forever, in any format — no need to worry about changing contract terms or pricing. Why We Should Unglue This Book Librarianship is service-focused profession that is about connecting people and information. This book provides a realistic view of the field, covering a range of different types of libraries, assorted types of positions, and various challenges and changes that make librarianship exciting and keep it from getting old. Who will find it useful? Potential librarians: as a reference source to help point them to further resources and more specific areas of interest. I bought Lauren’s book primarily because I love her blog, and greatly enjoy the quality of her writing and thinking, and secondarily as a show of support to a friend and colleague. As a librarian with 17 years in the biz (clearly not the target audience) I didn’t think I’d necessarily get much out of the book, other than an enjoyable read. Well I got that, but I also learned A LOT!! Lauren did an amazing job of covering so many aspects of librarianship–aspects that I frankly don’t engage with or think about often– that I got much more out of the book than I ever imagined I would. Reading it was stimulating, energizing, and thought-provoking. It gave me a clearer idea about what my colleagues across the profession do, and I felt myself developing a stronger connection to a profession that I already felt quite connected to! Based on my experience, I highly recommend the book to seasoned professionals as well as newbies. If you work in libraries, regardless of your position, or time in the field, this book is for you. Helping out College Students The primary audience is a group that doesn’t have funds for extensive book collections. They’re college students and new graduate students. They have student debt, and are responsible for making tuition payments on limited income. Let’s unglue this book for college students considering the field, and graduate students just starting to explore it. So What Do you Get Out Of it? You will get a thank you, a sticker, a book from Library Juice Press, or a Library Juice Press gift certificate, depending on the amount of your donation. And, ultimately, an Unglued book about librarianship to share with those who might want to do what you do for a living. You get a chance to participate in an experiment in an alternative model of information sharing. And, you get an opportunity to share both Unglue.it and the surprising profession of librarianship with the world. $25 An attractive sticker advertising Unglue.it and Library Juice Press. Only 180 remaining! $35 A copy of Speaking of Information: The Library Juice Quotation book. Only 42 remaining! $50 A gift certificate worth $25 toward purchases of books from Library Juice Press or Litwin Books. Only 42 remaining! $200 A gift certificate worth $50 toward online classes at Library Juice Academy. Only 50 remaining! Any amountThe unglued ebook, free for you to read and share. $25 and upYour name in the acknowledgements section of the unglued ebook under “Supporters”. $50 and upYour name & profile link in the acknowledgements section of the unglued ebook under “Benefactors”. Thanks for updating, Stephen! We are SUPER EXCITED to be able to unglue a book by and for librarians. Thank you for the mention!! We are very excited about this!